Most Hamilton models are gold or silver, but rarely are they both. Hamilton even went to the trouble of rhodium plating yellow gold figures when the case was white gold or gold filled. 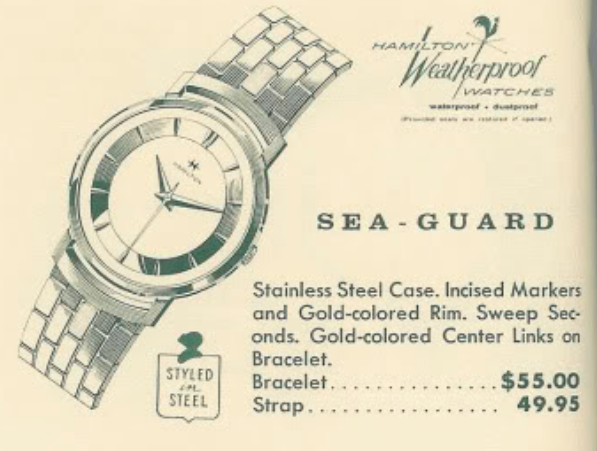 There are a few "silver and gold" models out there though, and one of them is the 1961 Sea Guard. It was produced through 1963. You can't tell from the catalog image but the write up explains that the stainless steel case is contrasted with a gold chapter ring and gold links going down the center the of the bracelet. It's a very nice looking watch, in my opinion. Tucked inside the waterproof case is a Swiss-made Hamilton 688 manual winding movement. This ETA-made grade is a manual winding sibling of the automatic 689 made in the same period. I recently had a fellow collector send me one of his new acquisitions. It looked familiar, as I think he out-bid me for it... which seems to happen quite frequently nowadays. What drew both of our attentions though, is it came with it's original bracelet! As received, it was in nice looking condition. All it really needs is a trip to the spa and fresh lubrication. Like most "waterproof" models of the 1960's, the Sea Guard is a front-loader. So it opens through the crystal and a special tool is needed to compress the crystal and lift it off the case. The "waterproof" models all carried a disclaimer - the seals in the crown have to be good, otherwise water can still get in. As a general rule, you should keep all watches, even modern ones, away from water unless you know for sure that the crown seals are solid. My movement photo is a little blurry but you can tell this movement looks very nice, but that doesn't mean the oil inside hasn't evaporated. This movement's "center wheel" is actually off to the side at about 8:00 in the shot below. So the cannon pinion on this movement is special. It's got a gold ring around it that engages the "third wheel" and as the third wheel turns, the cannon pinion turns. You need to put a tiny bit of oil on the inside of the gold ring so that it can slip around the cannon pinion when you set the time. But first, this is going through the cleaner. The balance is swinging away with good motion so it's off to the timer. Everything looks good. It was running a web fast so you can see the effect of my tweaking the regulator to slow it down and then to speed it back up until I got the two lines to level out horizontally. Now you can see how sweet this watch looks with it's matching bracelet. The hands look black since they're reflecting the shadow out side my light tent. The hands are silver though. This is a great looking watch... I should have bid more and made my friend pay more dearly for it! My granfather bought one of these new and I just passed it down to my son. That's great! Nothing beats a family watch as far as heirlooms go. If he makes sure a watchmaker cleans and oils it every few years then he'll be able to hand it down to his son some day too.